Protists are the highly diverse and abundant majority of eukaryotes, yet we still struggle to capture all of that diversity. Several clades of described, but rare, organisms have never been examined using molecular methods to place them in a phylogenetic context. We were able to acquire single-cell transcriptome data from one such group, Hemimastigophora. Remarkably we found that Hemimastigophora fall deep between established major groups of eukaryotes, potentially close to the much-discussed root of eukaryotes. Highly diverse, abundant, and widespread, protists are the often-overlooked eukaryote majority. They represent the overwhelmingly (but not exclusively) unicellular and microbial nucleus-bearing life outside the plant, animal, and fungal ‘kingdoms’. It has been three centuries since microbes were first discovered; yet, microbial diversity remains one of the major frontiers of human knowledge. It is only thanks to recent innovations in sequencing technology that microbial evolution can be studied seriously. As a result, in the last two decades, almost all known eukaryotic lifeforms have been placed into a small number of comparatively stable ‘supergroups’, that is collections of organisms larger than ‘kingdoms’. However, there remain a few already known-to-science groups of eukaryotes for whom there are no sequence data—owing to the rarity of these organisms (or their ability to evade being seen), our inability to culture them, or some combination thereof. One such group are the Hemimastigophora (‘hemimastigotes’ between friends), containing species known since the 19 thcentury but seldom seen or studied since. No molecular data were available for this group, nor cultures, and their placement in the eukaryote tree of life was entirely unknown. This is how we discovered them. Fig. 1. General landscape (left) and close-up of the approximate location of dirt scraping (right). It was a cold April day on a local trail in Nova Scotia during a hike organised by the department graduate student society (Fig. 1). Sporadic sampling is a known professional hazard in protistology, since all we really need for an explosion of interesting things to look at is a few millilitres of water and/or dirt or sediment. Thus, a small scraping of soil signalled the opening of the 2016 microbe-hunting season in Nova Scotia. Yana soaked the soil in distilled water for about a month, periodically observing what was living there—hoping for but definitely not expecting the rarely-seen ‘hemimastigotes’. One evening, small, ~20 µm long, lanceolate cells showed up that behaved not quite like any ‘common’ flagellate, and after 3 hours of picking up (and losing) single cells, we were able to finally examine one of them up close. It was Spironema, one of the ‘hemimastigotes’ (Fig. 2)! Fig. 2. The first observed Spironema. This image took 3 hours to obtain. The next day, we immediately dropped everything to gather Spironema for single-cell transcriptomics—Gordon’s expertise (Fig. 3). Small, barely discernible in the Petri dish, and with a stealthy habit of standing still among debris, the cells were incredibly annoying to pick and progress was slow. And the dish was overwhelmed by a weedy organism reminiscent of a ciliate, a member of a large group of ‘hairy’ (multi-flagellated) cells. Except it was moving a bit awkwardly for a ciliate, and the shape wasn’t quite right. “It can’t be…” Yana muttered as she grabbed a copy of the only paper on Hemimastix (Foissner et al 1988)—its only previous appearance in the scientific literature, 30 years ago. Until, remarkably, that one exact Petri dish in which we were hunting Spironema. Thus, in a single day, we were able to collect material for sequencing from two members of this seldom-seen group! Fig 3. 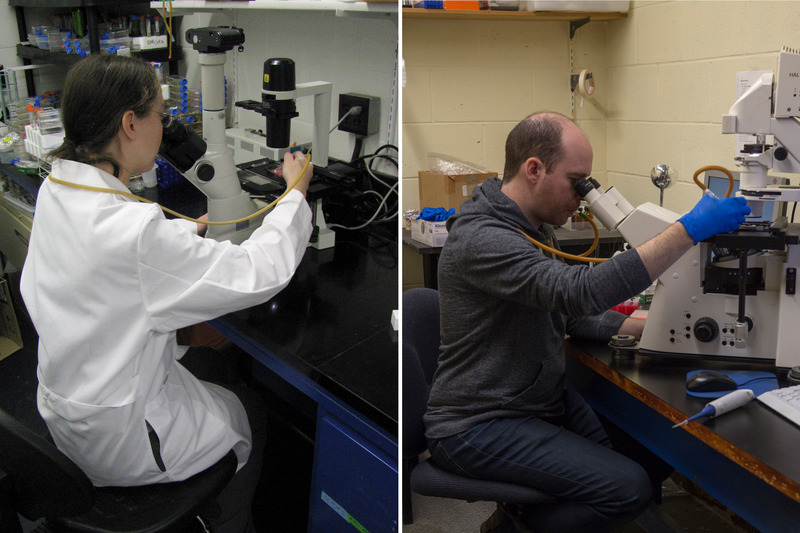 Yana Eglit (left) and Gordon Lax (right) with cell-picking setup. Following an intense afternoon of picking single cells, Gordon obtained partial transcriptome material from just two and four cells of Hemimastix and Spironema, respectively (Fig. 4)—something the state of technology would have made seem absurd just a few years ago. After waiting a few weeks for the sequencing to come in, we obtained our phylogenetic marker genes and enlisted the help of Laura Eme, an expert in eukaryote phylogenomics (and made some bets on which ‘supergroup’ our organisms would go into). 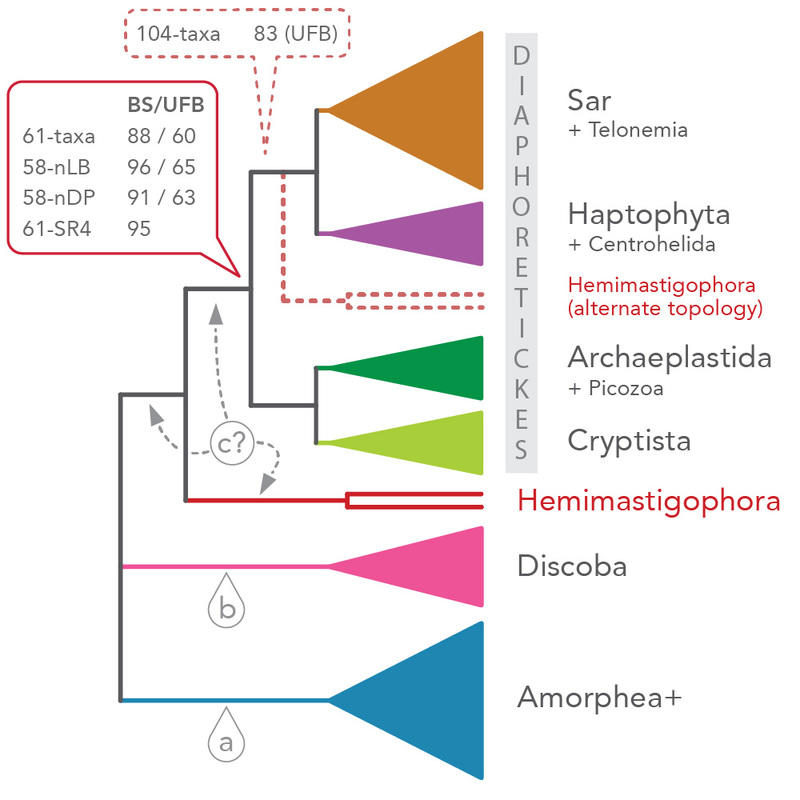 Following weeks of extensive bioinformatic clean-up, we vividly remember when we saw our first phylogenomic tree of eukaryotes with ‘hemimastigotes’: which went… nowhere in particular. ‘Hemimastigotes’ did not fall within any previously-characterised major group of eukaryotes, representing a ‘supergroup’ of their own (Fig. 5). No one won the bet. But we didn’t mind, and our enthusiasm was later shared by our colleagues when we presented our findings at an international conference on protistology in Prague (ICOP2017). Fig. 5. Phylogenomic tree of Hemimastigophora in a eukaryotic context, with alternative positions marked. While the culture-independent sequencing methods were in full swing, we were also able to establish a stable predator-prey culture of the Hemimastix, which can be studied further and shared with others. 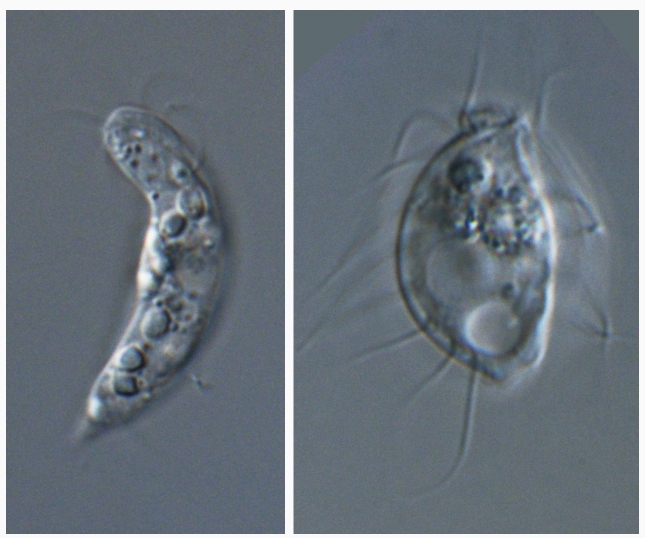 Finding something so distinct from other known eukaryote life truly feels exhilarating; any further study of ‘hemimastigotes’ carries a chance of additional interesting discoveries—be it biochemistry, genomics, cell biology, or ecology, to name a few—and we are excited to see what our present and future collaborators will find. We had an intense learning experience trying some proof-of-concept investigations into gene distributions, and environmental sequence analysis, not to mention exploring the vast potential of single-cell transcriptomics. Finally, it turned out the Hemimastix differed from the previously-described species in size and number of flagella, so we had an opportunity to name it. 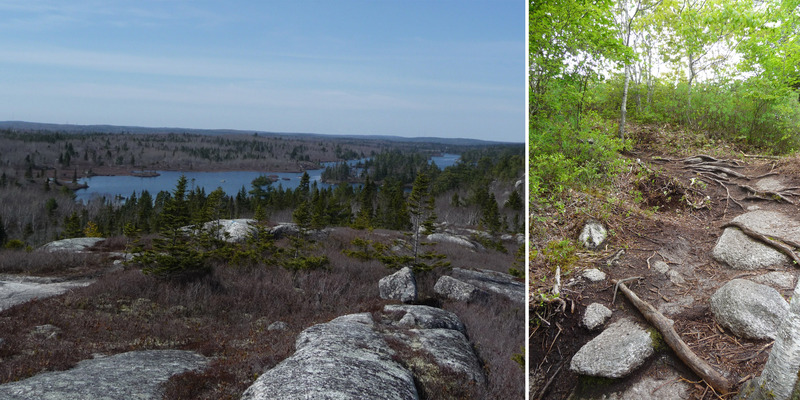 Since we and the new Hemimastix species live and work in traditional (and unceded) lands of the Mi’kmaq First Nation, we named it Hemimastix kukwesjijk, after Kukwes, a mythical hairy ogre of Mi’kmaq mythology, hoping to bring attention to the invisible beings lurking in a land—microbial and mythological/historical—while honouring the Mi’kmaq culture and people. Absolutely amazing. So exciting. Can't wait to see where this discovery takes us.